Pending post. Handouts will be posted as made available from speakers; handouts are electronic for course attendees to download or print in advance for use as desired. Password required. Attendees will be emailed a password as the handouts become available. PT, PTA, OT, OTA, SLP Clinicians looking to advance their clinical expertise when working with Neurodegenerative Disorders and Rehabilitation. Heather M. Smith, MA, CCC/SLP is currently a senior speech language pathologist at the TIRR Memorial Hermann Outpatient Rehabilitation Clinic at Memorial City. She is one of the lead therapists providing mentoring, guidance, and collaboration with other speech language pathologists across the sites. Heather has 13 years of experience as speech language pathologist and has an extensive background in the evaluation and treatment of patients with Parkinson’s disease and Movement Disorders across the continuum of care. She is certified in Lee Silverman Voice Treatment (LSVT)-LOUD and is proficient in Modified Barium Swallow Studies, McNeil Dysphagia Treatment, Flexible Fiberoptic Nasoendoscopy among others. Carol Bodenheimer, MD is board certified in both Physical Medicine And Rehabilitation and Electrodiagnostic Medicine. She has a subspecialty certification in Spinal Cord Injury Medicine. She provides a broad range of treatments for Spasticty Management. She is also an Assistant Professor in the Department of Physical Medicine and Rehabilitation at Baylor College of Medicine. 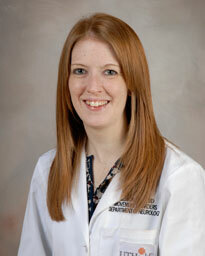 Allison Boyle, MD is an Assistant Professor in the Department of Neurology for UT Health McGovern Medical School. She earned her medical degree from University of Texas Health Science Center in Houston along with her Internship in Internal Medicine, her Residency in Neurology, and her Fellowship in Movement Disorders. OT: Memorial Hermann Health System is an AOTA Approved Provider of continuing education. The assignment of AOTA CEU’s does not imply endorsement of specific course content, products, or clinical procedures from AOTA. SLP: Memorial Hermann Health System is an ASHA Approved Provider of continuing education- provider ID ABAF. The assignment of ASHA CEU’s does not imply endorsement of specific course content, products, or clinical procedures from ASHA.